The kente worn by the legislators is an icon of African heritage. It is identified by its "dazzling, multicolored patterns of bright colors, geometric shapes and bold designs," according to the Smithsonian's National Museum of African Art . 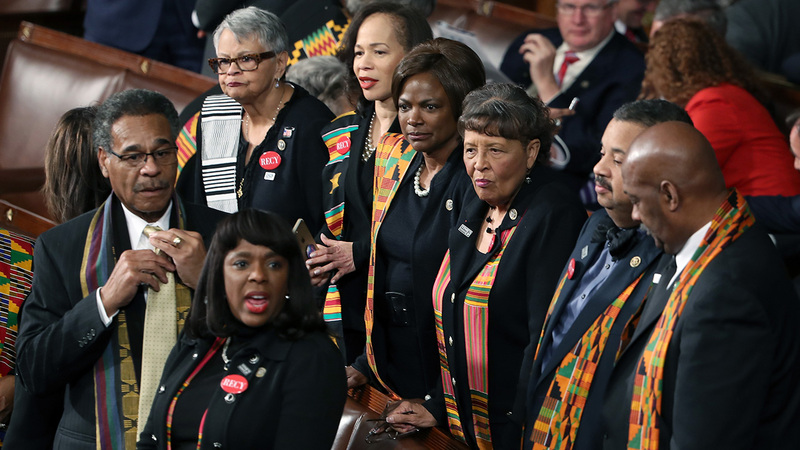 "Wearing kente cloth to the #SOTU with my fellow @OfficialCBC Members to stand in solidarity with people from you-know-what countries," Rep. Bobby Scott, D-Va., tweeted about the demonstration on Tuesday evening. The Democratic Women's Working Group also organized a demonstration encouraging those who will attend to wear black in solidarity with the Time's Up movement. Democratic Senators, House representative, and guests sit and look on as US President Donald Trump delivers the State of the Union address at the US Capitol. In 2017, the same group wore white to Trump's first joint address to Congress. Trump controversially renewed his support for Alabama Senate candidate Roy Moore's election campaign even after several women accused Moore of sexual misconduct. Trump himself became part of the national conversation surrounding sexual misconduct during his 2016 election campaign when a decade-old tape surfaced that included audio of Trump and Billy Bush having a lewd conversation about women.